OK, so where I work is having a sale at the moment and it lasts for quite some time. This will be the second weekend of the sale and I am a little exhausted. We are busy, busy over the weekend. Even though I have been working, I have still had a little time to sew. 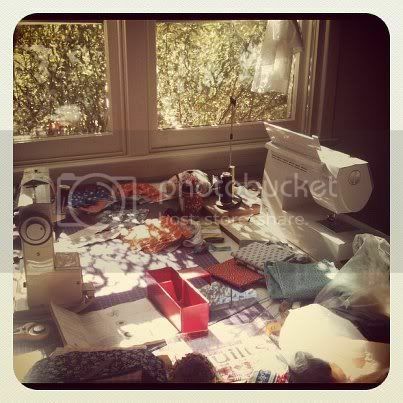 Who wouldn't want to sew sitting here near the window with some winter sun coming through. Nice Hey? It is a little untidy and I have two machines out as I was checking my Bernina machine to make sure it was running nicely. 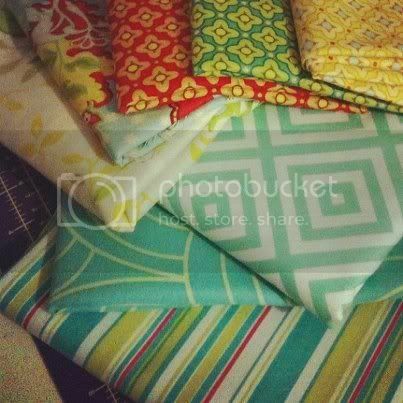 I haven't finished anything yet, but I think there is always time and room, to bring in more fabrics! Today I came home with these goodies. I love all these colours and since I haven't been shopping for something for me, I bought these with the intention to make a couch quilt. No idea what pattern to use yet or when I will get it started, but it should be nice and bright. I ended up with a bit of Heather Bailey, some Jennifer Paganelli and a little Fever. I think these mix so nicely. Can't wait to get started.